These salmon burgers are good and not difficult to make. It was a bit unsettling to put raw fish in the blender but it all worked out fine. Some of the French Friday cooks warned that the burgers tend to not stick together and are difficult to turn but that wasn't my experience. It had nothing to do with my ability and everything to do with the salmon I am sure! I made a relish of tomatoes, red onion and parsley! Worked great with the salmon. 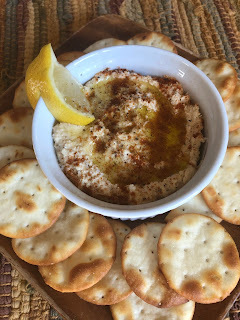 Dorie recommends serving these with coleslaw or Basta Pasta Potato Salad and, feeling like an over achiever, I made both! 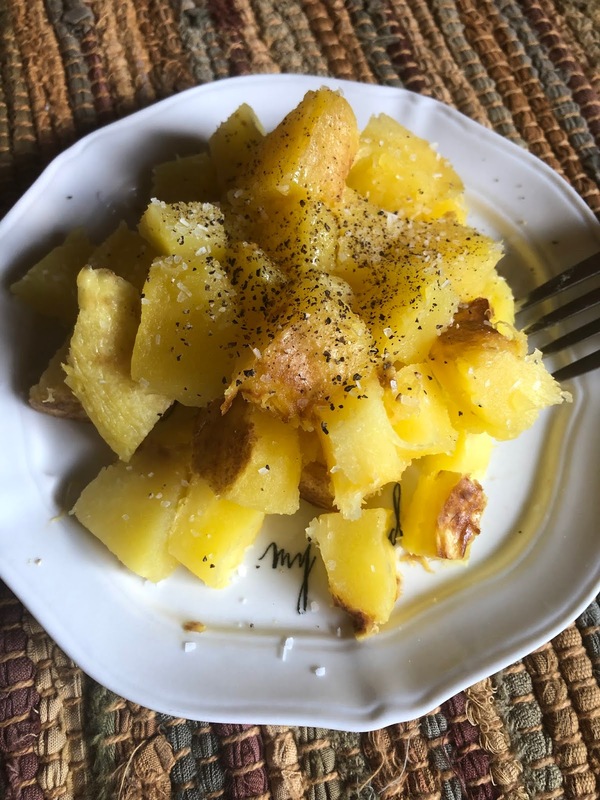 I was uncertain about the potato salad because Gary loves potato salad and has often not liked it if I change up the recipe but there was no need to worry here! He loved it! I loved it! And while the burgers were good, the potato salad was exceptional! The slaw was great too! Gratuitous baby picture of Savi's first trip to the zoo. 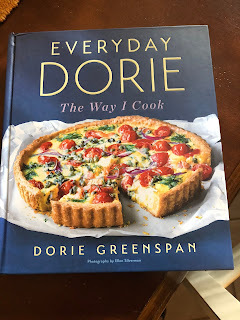 Go to Everyday Dorie if you'd like to follow along with us as we cook through Dorie Greenspan's latest cookbook. I've been a bit under the weather lately. I was tempted to pass on this recipe but I saw Mardi's picture on Instagram and thought I should get off the sofa and get it done, with a bit of help from my sous chef, Gary. While I've been sick Gary baked a ham (he did his best to keep me fed thru my illness) so I asked him to use the bone to make broth for the potato chowder. He not only boiled the bone, he defatted the broth and cubed some of the ham. 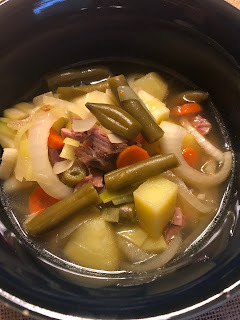 Adrianna, over at Great Food 360, said she used parsnips in place of some of the potatoes in her recipe so I used parsnips and potatoes and carrots and then added a can of green beans. I also used leeks and onions and garlic. It was simple and quite delicious and just what my sore throat needed. I have a troubled history with corn bread. I make it and its good. The problem is it almost always sticks to the pan. I know the secret is to get the pan hot, really hot before adding the cornbread batter but I guess I've never gotten it quite hot enough....until tonight. It was perfect except for a dime size spot right in the center. I accept that as cornbread's way of mocking me. 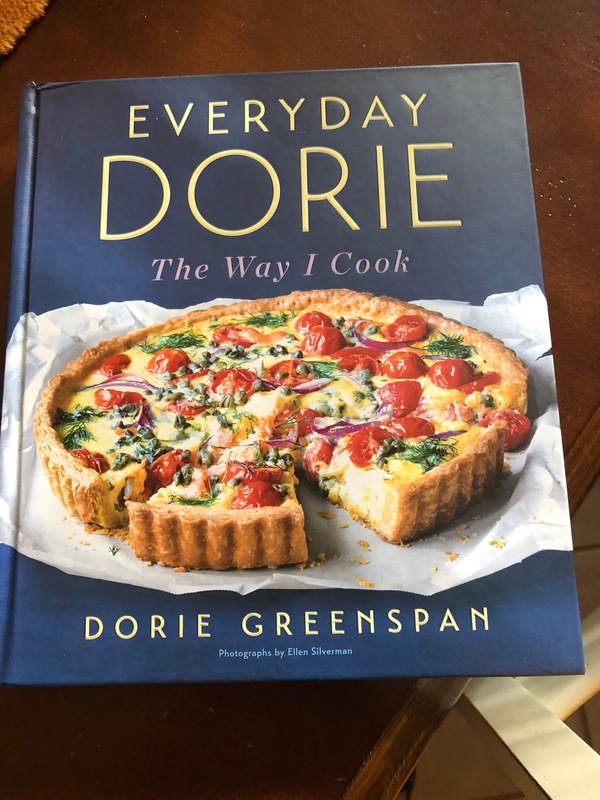 We're having a great time cooking through Everyday Dorie by Dorie Greenspan! Check it out here. Dorie is more sophisticated than I. 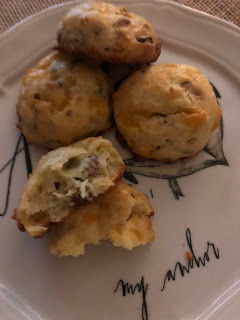 Even though I suspected as much, after all she lives in NYC, Paris and Connecticut while I live in Oklahoma City and sometimes an extended stay in an RV, when I read this recipe there could be no denying it. I can't even find pomegranate molasses in my town and she uses it in everyday recipes! I asked my mideastern friend if she uses it thinking to either borrow a couple of tablespoons or make a gift of the unused portion but she'd never even heard of it. I guess her sophistication is on par with mine. C'est la vie! Yes, I could make my own from pomegranate juice but in keeping with my desire to simplify I decided to go another route. I roasted and ate the acorn squash with ghee, salt and pepper. Delicious! I then made a delicious yet plain humus following a standard recipe of a can of chickpeas, tahini, garlic, lemon and olive oil. I hope all the Doristas have a Merry Christmas! You can find all Dorista links at Everyday Dorie. We're ba-ack! Its good to be a Dorista again! Our first recipe in Everyday Dorie is her Newest Gougeres. I thought her old gougeres were good but these are even better. I baked a few and put the rest in the freezer so I'll be ready for a cocktail party in an instant. Why don't people have cocktail parties anymore? They used to be THE way to entertain and I miss them. Maybe I'll organize an impromptu one soon. 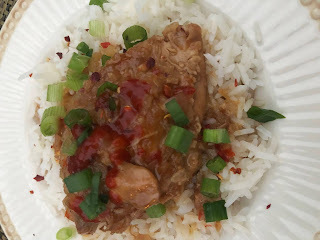 Stop by the Cook the Book Fridays site. You might want to join us! The Tour de France has ended! It was a good one with plenty of drama. My take away, however, is about plastic use awareness. The leading team in professional cycling these days is a British team called Team Sky. They have #PassOnPlastic on their uniforms and after a couple of days of watching I became curious about what it means. Oh yeh, there’s also the outline of a whale on their backs. Team Sky has become involved in promoting awareness of plastic pollution in our oceans and efforts at clean up as well as reducing our use of single use plastic. This led me deeper into plastic use and recycling in general. Did you know that much of our recycling ends up in land fills? 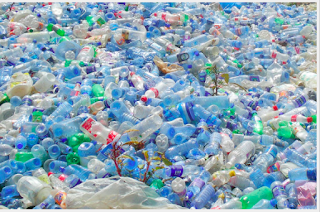 China used to buy much of the worlds minimally processed recycling but has cut back and now has much higher standards for what they will accept. You are probably aware that recycling companies ask for clean recyclables. No food particles or excess oil on that pizza box for instance but you might not realize how important that is. When the cardboard is combined to make a bundle a machine does a reading to detect contamination by non-cardboard substances. If the contamination is over the acceptable level the entire bundle is discarded and most likely ends up in a landfill! The ENTIRE BUNDLE!!! Not only that but if you toss your empty cereal box into the recycling bin with the waxy bag the cereal was packaged in still inside there is a very good chance the same thing happens. Too much non-cardboard contamination results in the ENTIRE BUNDLE going to the landfill. 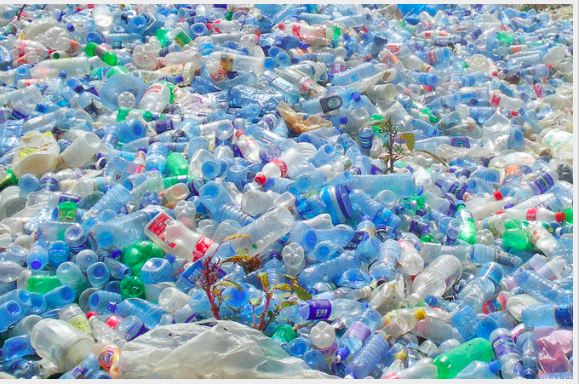 We cannot get away from plastic use in the modern world and we probably don’t want to. There are many wonderful and worthwhile uses for plastic but is a single use straw one of them? How about the plastic lid that comes on top of your take away drink? I was surprised to learn that my Starbucks hot coffee cup is not recyclable! They continue to work towards a cup that is recyclable but currently hot cups have a thin plastic lining to prevent the hot beverage from soaking into the paper cup and that makes the cup two things, plastic and paper and current recycling is unable to handle that in most recycling centers. I think there might be a couple of centers able to handle that combo, one in New York and one in Washington. I think. So friends, let’s all do what we can! Carry your own straw! Eliminate or reduce your plastic water bottle use. Buy a cup to take to your favorite coffee place instead of using a disposable cup. And by the way, you have to go inside a Starbucks with your personal cup. They have to keep the drive through moving and are making your drink while you sit comfortably in your car. They will make it in a disposable cup and pour it into your personal cup when you reach the window. Sorry, there are some sacrifices. But if you think that’s too hard or you don’t want to change take a look at your local waste disposal site. How much has it grown since you’ve been living wherever you are? How much will it grow by the time your grandchildren are adults. There are 632 active landfills in the U.S. according to the EPA. I don't think that includes transfer stations. There are a couple of thousand inactive landfills. Its time for us to be more responsible stewards of our beautiful home, Mother Earth.